Located in the Central Maya Lowlands in what is now northern Guatemala, the Preclassic city of El Mirador was a giant compared to most of its contemporaries. Its massive ruins still tower above the rainforest canopy. They are silent witnesses to Maya ingenuity and the Maya’s ability to sustain such a massive settlement so early in their history. Agriculture involving the cultivation of corn, beans and squash enabled its inhabitants to thrive. Manmade plaster-lined catchment areas collected water, making up for the absence of rivers. Even in such apparently mundane aspects of city life, the Maya showed their artistic nature. Dr. Richard Hansen kneeling next to plastered panel at El Mirador. (Image courtesy of Dr. Hansen). In March 2009, archaeologists discovered a series of panels made of carved and modeled-lime plaster that lined a water collection system in an area of the city known as the Central Acropolis. The panels and water collection tanks date to the Late Preclassic period, from 300 B.C. to the beginning of our era. The panels, which flank the series of pools in this unique water control system, depict two “swimming” individuals that are framed by cosmic monsters of great importance in ancient Maya art. 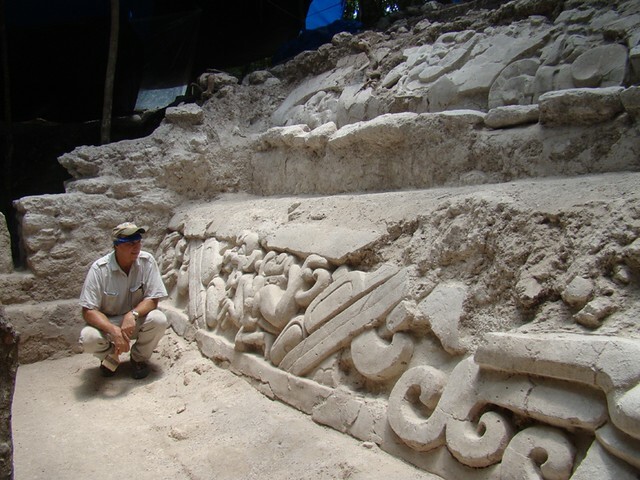 According to Dr. Richard Hansen, who led the team of archaeologists at El Mirador: “[T]he ‘swimmers’ represent the Hero Twins of the Popol Vuh.” He is referring to the Quiche Maya text of the Maya creation story, which was found in the highland town of Chichicastenango in A.D. 1700 and transcribed by a Dominican monk named Francisco Ximenez by about 1704 A.D. 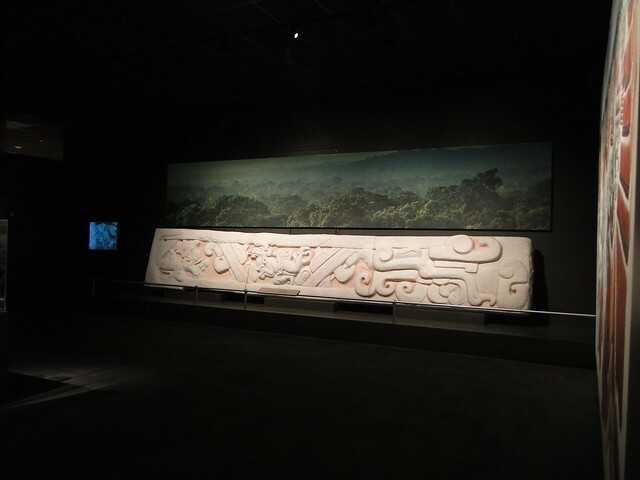 Replica of the El Mirador panel on display at the Houston Museum of Natural Science. What we have here is one of the earliest representations to mythical characters we know from the Popol Vuh. The problem is that there is a huge time gap between this plaster panel and the earliest-known document referencing the Popol Vuh. The Newberry Library’s manuscript of this creation story is one of the most widely known and possibly the earliest surviving copy. It was transcribed between 1700 and 1715 in Chichicastenango, Guatemala, by the Dominican priest Francisco Ximénez. Father Brasseur de Bourbourg published a French translation of the text in1861. Images of the title page and first page of the text of the Ximenez manuscript are also on display. An original print of the latter, dating back to 1861, is currently also on display at our Maya 2012: Prophecy Becomes History exhibit. An alternative interpretation of what we see in the panel is that it illustrates the role of Maya royalty. As intermediaries between our physical world and the supernatural one, Maya rulers were called upon to ensure plentiful rains. Proponents of either hypothesis have reasons to support their line of thinking. Because there are no inscriptions clearly identifying these characters in the water as either mythical heroes or historical rulers from El Mirador, I would favor a third interpretation: we just do not know who is represented here. Visit Maya 2012: Prophecy Becomes History through March 31 and draw your own conclusions. With due respect for Dr. Houston, the two swimming figures in the El Mirador panel have at least two strong connections to the Hero Twins of the Popol Vuh. One of the figures carries on his back a severed head (quite possibly the head of the First Father, the father of the twins) through the watery realm of Xibalba leading to his partial resurrection as the corn god and planet Venus. According to the Popol Vuh, the father had been decapitated in the ballcourt sacrifice ceremony by the lords of Xibalba and hung from a tree, then carried to the earth’s surface by the Hero Twins after their defeat of these lords. Perhaps it was a theatrical dramatization of this important religious event as was an important ceremonial practice among the ancient Maya elite. Nevertheless, it strongly resembles this event in the Popol Vuh. The same figure also wears what appears to be a jaguar head headdress, perhaps identifying him as Xpalanque, or Jaguar-Deer of the Quiche version of the Popol Vuh. Identifying the name of a Maya figure from the figures in the headgear is also common in ancient Maya art.